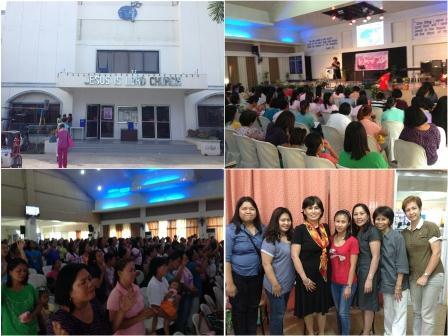 The JIL Church Nueva Ecija Chapter hosted a Women Seminar last May 31, 2014 with the theme, "THE MAKING OF A SANCTIFIED WOMAN" based from the verse 1 Thessalonians 5:23. A total of 500 women gathered together in celebration of Mothers' Day. Their special guest, Sis Lilian C. Garcia who is the Admin Head of JIL Pampanga and the Regional Director of BFAR Region 3, delivered such powerful and anointed messages namely: "A woman who walks closely with God" based from 1 Samuel, "Re-discovering the Proverbs 31 Woman" from Proverbs 31:10-31 and "Becoming a Woman of Inner Beauty" from 1 Peter 3:3-4. Through this event, many women were empowered and uplifted, bringing out the best in them for the glory of the living God.